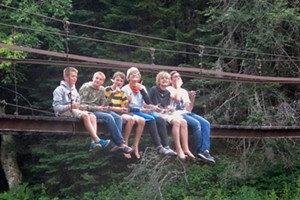 Somewhat Scary | Bookworms | Kids VT - small people, big ideas! On a Megabus trip to Boston last year, author Katherine Arden paid extra for a prime upper deck seat, anticipating an awesome view. But when dense fog surrounded the bus, the writer turned her disappointment into creativity. During the ride, she scribbled notes that became "the bones" of a spooky middle grade novel, Small Spaces, released this September. The book features spunky 11-year-old Ollie Adler, who lives with her dad in a house called the Egg — a name inspired by the house's Easter-like colors. In the opening scenes, Ollie — who recently lost her mother — confronts an agitated woman near a swimming hole and steals a book the woman attempts to throw into the water. 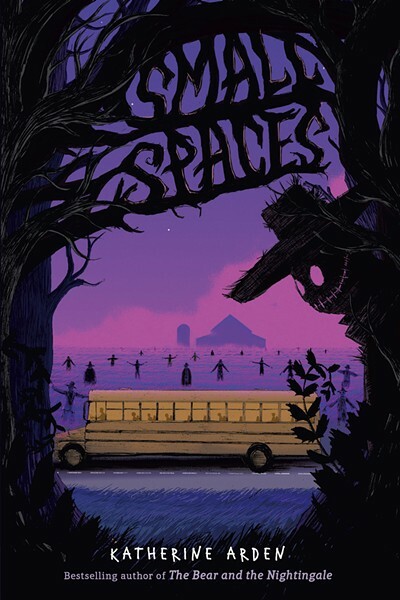 Small Spaces takes a twisted turn when Ollie, on a school field trip to a haunted farm, discovers real-life gravestones inscribed with the names of the book's characters. With the help of two new friends, she sets out to solve this spine-tingling mystery. Arden describes herself as a writer in "career phase two." Her well-received 2017 debut, The Bear and the Nightingale, a crossover adult/young adult literary fantasy novel based in Russia, was followed by a sequel, The Girl in the Tower. The trilogy's final installment, The Winter of the Witch, hits bookstores in January. Arden's second middle grade novel is due out next fall. She spoke with Kids VT from her East Middlebury home. Kids VT: Can you give our readers a teaser about Small Spaces? Katherine Arden: I love Vermont in the fall, with all the harvest festivals and pumpkins — that clichéd Vermont ... So I wrote in a corn maze and a haunted house. You know how many houses put scarecrows around them? Right at dusk, they're really creepy. So I wondered, What if a scarecrow moved? I'm a huge Goosebumps [series] fan, and I love atmosphere. The book isn't gory, but more like, What's under the bed? KVT: Without spoiling the fast-paced plot, could you comment about the deeper themes in this book? KA: I really think you need a personal journey in a book. I wanted Ollie to be a recognizable person beyond the one bad thing that happened to her, so that's not her entire personality. The book is also about her sadness, her mourning and how she gets through. Middle school is a time when kids are put into little tiny boxes: the popular girl, the jock, into science or Dungeons & Dragons. I wanted to subvert the boxes a little. So Coco [Ollie's classmate] is a pretty girl, but she's not a popular girl. KVT: The luminescent cover illustration was created by well-known London artist Matt Saunders, who also does artwork for J. K. Rowling's Pottermore website. KA: He's one of the greatest. My editor thought Matt had a good vibe for the book, and he just jumped on it with this incredible drawing. He's going to do the next book. I'm excited! KVT: What's your advice to aspiring authors? KA: Finish what you start. Go beyond the first rush of excitement. You'll learn more from finishing it up. Even on the days when you don't like the book, keep putting words down. The Vermont Book Shop in Middlebury hosts an open house for Katherine Arden on Friday, Oct. 26, from 5 p.m. to 7 p.m., with an author meet-and-greet, book signing, party favors, treats and activities. Learn more about the author at katherinearden.com.